One of the new food trucks I tried at the All About Downtown Festival in Jersey City over the weekend was Home By The Range. Their tagline is Locally Inspired Street Food, which sounded promising. Home By The Range makes local, fresh organic sandwiches and side dishes. Their menu is driven by what’s available, so it’s not extensive. 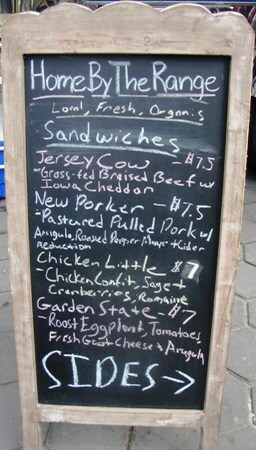 Everything on the menu looked good, so I asked for two half sandwiches – 1/2 a New Jersey Cow and 1/2 a New Porker. You can see that day’s menu here, although it changes based on what’s in season. The first thing I tried was the Jersey Cow, which was braised beef with cheddar cheese. The beef was as soft, juicy and tender as any I’ve had. It held together, but just barely. Someone without teeth could have eaten this beef (sorry about the imagery). The cheddar cheese was sharp, which was perfect with the braised beef. This was an excellent start to my lunch. After the Jersey Cow, I tried some of the side dishes. The potato salad had large chunks of different types of potatoes, including purple ones, and was a good side dish. At first I wasn’t enthused about the heirloom tomato and corn salad because I’m not a big tomato fan – but this looked really good. The tomatoes had great color, and tasted even better. With the corn and herbs, this was a wonderful side dish, even for people who don’t love tomatoes. The New Porker was pulled pork with arugula, roasted red pepper mayo, and a cider reduction. As with the beef, the pork was very tender and juicy – but what really got my attention was the roasted red pepper mayo. It was a little on the sweet side (was honey added) and added nicely to the sandwich. On second thought, maybe the sweetness was the cider reduction. Either way, it was tasty with the pulled pork. Before last weekend, I heard good things about Home By The Range, but it was even better than I expected. The meats were delicious, but if you’re a vegetarian, between the sides dishes and the Garden State sandwich (roasted eggplant and more), there’s plenty here for you too. Home By The Range alternates between Hoboken and Jersey City, so check their twitter feed here or their website here for locations. Maybe we can even get them into the city for a festival or two.